It seems like forever since I've had the time to make a blog post. The past two weeks have been so crazy. However the first two days are finished and things will start calming down a bit, hopefully. The worst part of the first days are all the papers that have to be collected and recorded. I feel more like a secretary lately than a teacher. I still need to update my class website and enter parent email addresses when I finish this post so I'm going to make it quick. Here is a brief picture tour of my first few days. The first day I introduced myself with this video. This took so much time to make so I plan on reusing it for a few years. I then played a game with my students where they had to write down 2 true facts and 1 false statement about themselves. We then tried to guess which statement was the one not true about the student. 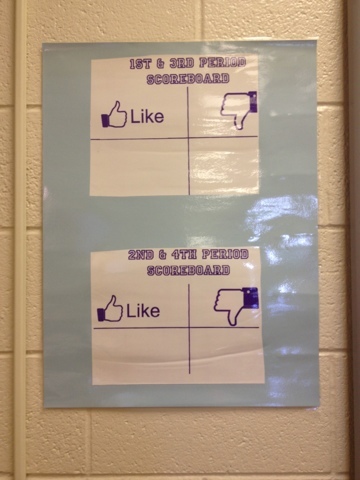 I started Whole Brain Teaching on the first day and introduced my scoreboard system for rewards. It was fun watching my students do gestures and smile while learning the rules. I am really hoping WBT will be a great way to teach this year. 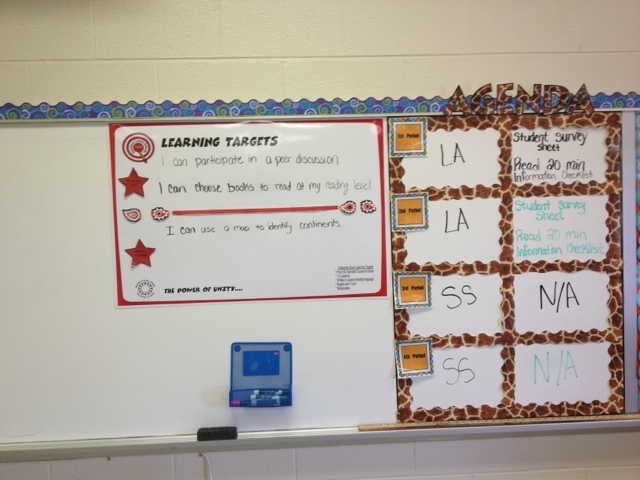 This shows my learning targets for the first few days. We are working on picking independent reading books and map skills in social studies. This is our first class bulletin board. 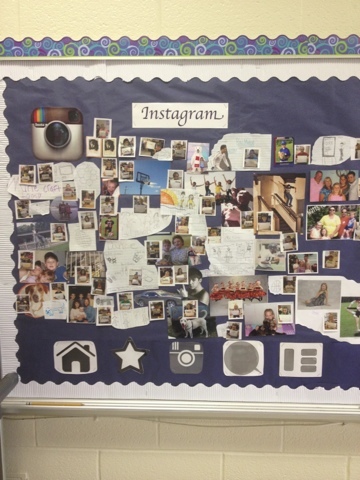 I took every students picture and they brought in pictures of something that was important to them. I was able to get an idea of how their writing skills were by having them write a paragraph about their picture. In language arts we have been talking about the importance of finding books to read. We set up reading notebooks and then starting looking for books we wanted to read. Some students knew of books they wanted to read but that I didn't have in my library. 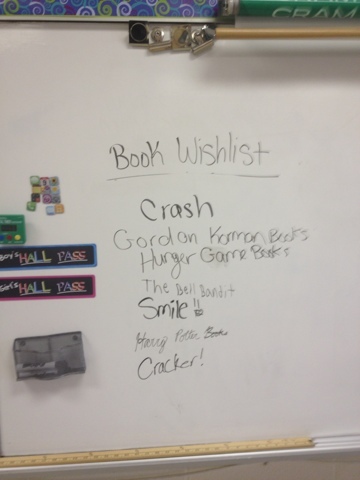 We started a list on my board of books we would like to add to the classroom library. The rest of this week we continue practicing our whole brain rules and procedures and setting up our reading notebooks. I will be discussing expectations for reading response letters and discussing strategies for independent reading. In social studies we are taking a pretest for our first unit and starting geography. I hope everyone else is having a great start back to school. I hate that my blogging time is more limited now, but I will try to post at least once or twice a week.